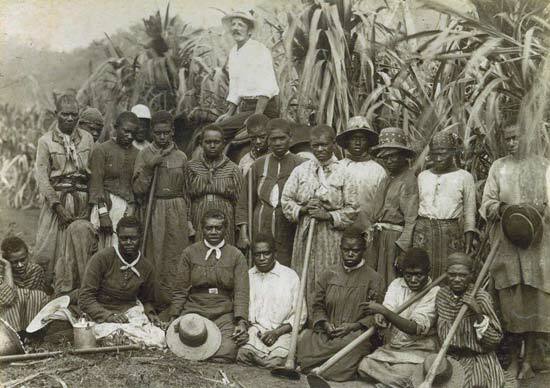 South Pacific Islanders (Kanakas), with an overseer (background), on a sugar plantation, Cairns, Queens., Austl., c. 1890. I pray, the world learns to love black people. You need to love black because,the bible says the black will restore the,kingdom……….god created man in the black coulor…. And to think certain whites rant about immigrants destroying their countries. The US would capture Pacific Islanders & force them to work on whaling ships in the 1850’s also. The Aussies would offer bible lessons and trick people onto ships to work on plantations. My Great Grandmother could be one of the wondrous Kanaka Women, caused to stop their work to be photographed with their slave master mounted on a horse and his whip hidden from view, in the top photo. That’s why it appears in my cover photo on FB. I say, “could be”, because as was the capitalist, colonial contempt of photographers in the past, and up to the present, the names of those in the photographs were not noted; and, because until recent times, this history of the british blackbirding of Pacific Islanders for the slave trade in their penal colony of new south wales was kept hidden, denied and avoided by them and the illegal entity now known as australia.. I am wondering where this photo comes from: the exact source? I am curious to know where the photo with the caption “Prisoners of Frontier Wars – Blackbirding & Chain Gangs” comes from?